Welcome to life unplugged at Ak'bol, Belize's First Yoga/Wellness Retreat Center and Eco Resort devoted and open to all styles of Yoga & Wellness. Ak'bol is located beachside on Belize's largest island, Ambergris Caye, just 1 3/4 miles from the old fishing village of San Pedro and less than a quarter mile from the second largest barrier reef in the world with world class diving. Ambergris Caye does not have any cars or paved roads- the island vibe is strong and soothing. I invite you to leave your shoes in your suitcase and unwind to the natural rhythm of the island... wake up to birds chirping... dine together as a community within a private palapa overlooking the sea with healthy vegetarian, vegan and local seafood meals. Enhance your experience within a palapa at the end of the 300' pier surrounded by clear blue water and practice with the energy of the sea beneath you. After class plunge into the sea or in the lagoon-inspired fresh water pool. The sea is your playground... engage yourself with diving, snorkeling, sailing, kayaking, windsurfing, Maya ruins... or relax in a hammock and listen to the birds. Get through that book you have been wanting to read, write in your journal and get a massage treatment. I look forward to unwinding and exploring paradise with you, as we slow things down to island time, on this radiance retreat! All cabanas are currently SOLD OUT. Please contact Chelsea if you would like to be on a waitlist, in the event that a village room opens up. $750 non-refundable deposit holds your space with the remainder due Dec 1, 2018. First ten signs ups will receive early bird pricing (rates as shown below are early bird, early bird is now sold out, please add $100 to each rate below for current pricing)! Add $100 to the rates below, for post early bird/current pricing. * Room availability is on a first come, first serve basis. *Past Retreat Yogis, ask about a repeat yogi discount! 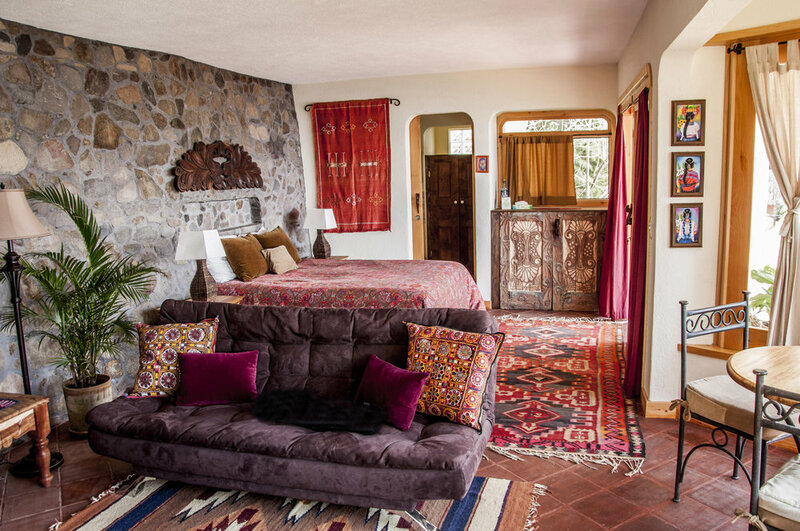 Each cabaña can accommodate 1-3 people, with a queen bed and two twins, and has its own private bathroom with sink and toilet and private, outdoor shower. Village Rooms accommodate 1-2 people and have shared bathrooms. Cancellation policy: Should you need to cancel your space, all payments become non-refundable if you cannot fill your spot. If you can fill your spot with a replacement yogi, you will receive all payments back, less $350. 7 nights in Caribbean Sea, Garden, and Village view accommodations in island-chic thatched cabañas. Option for private or shared occupancy. With conch shell faucets... bamboo showers... unplug and enjoy a barefoot, island vibe retreat! Twice daily yoga asana, pranayama and mediation classes with Chelsea in the open air, yoga pavilion, located over the Caribbean Sea. Practice to the soothing ocean breezes and the sound of mother ocean lapping beneath you. 3 delicious, healthy, locally sourced meals daily, tastefully prepared and artistically presented- inviting in a true Belizean flair. Meals will take a healthy approach to vegan and vegetarian cuisine, with optional local seafood offerings. Unlimited filtered water, juice and teas. 1 dinner is not included in retreat costs to allow you to venture into near by San Pedro and experience more local cuisine. Unlimited potential for adventure, soul searching and fun! Cost of transportation to Ak'bol- located on Ambergris Caye, Belize. Ak'Bol is happy to coordinate your 20 minute island flight from Belize City to San Pedro on Ambergris Caye, for a roundtrip price of $157. Once you land in San Pedro, you will hail a taxi (or golf cart), for roughly $17 to Ak'bol. A second more economical and adventurous option, is to take a taxi from Belize City airport to water taxi terminal for about $25 which takes about 25 minutes. Once there, the water taxi, which runs often, costs about $15 one way and takes about 1.5 hours to arrive in San Pedro. Once on San Pedro island, you would hail a golf cart to Ak'bol. Travel insurance (recommended): As times become more turbulent, travel insurance that would cover the costs of a canceled trip, is recommended. While this has never happened thus far, it is best to be prepared for an act of Man or Mother Nature that might prevent this trip from occurring. I look forward to sharing sun and space with you in island paradise of Ambergris Caye, Belize! 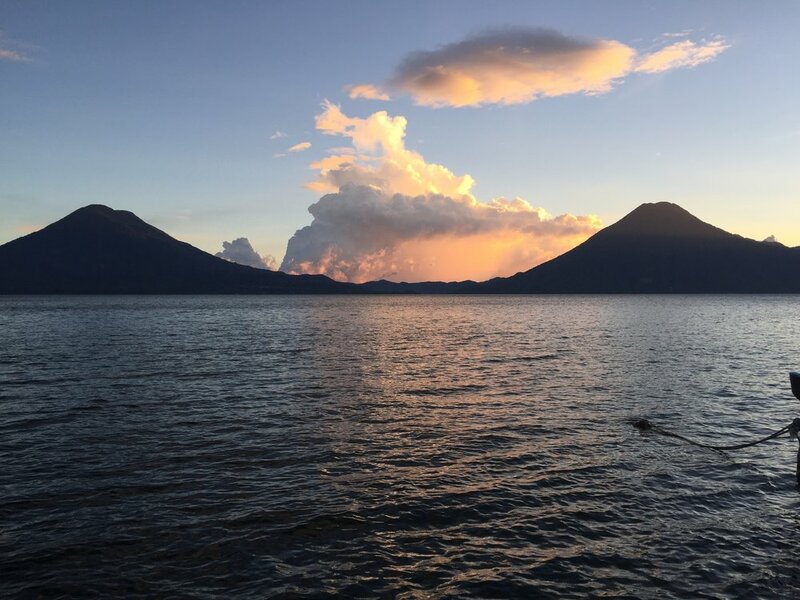 Lake Atitlán is believed by the Maya to be the center of the universe where God’s seeds of mankind evolved. 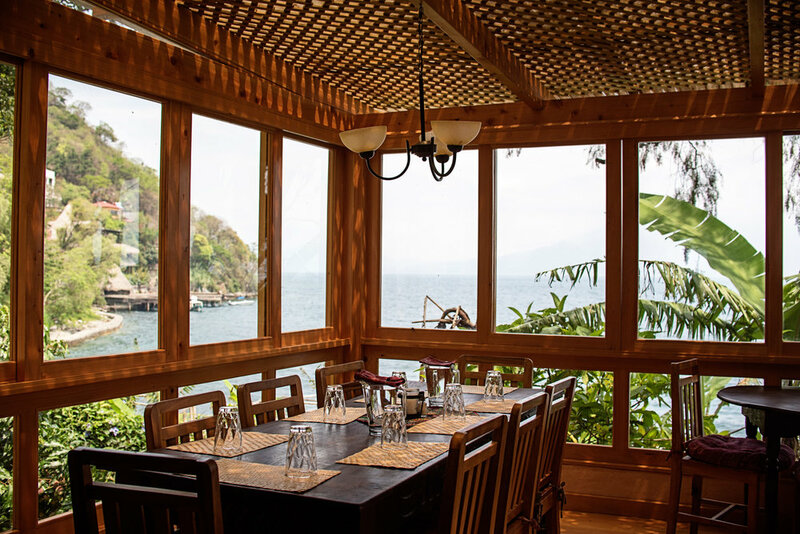 Villa Sumaya is nestled in a landlocked bay on the north shore of beautiful Lake Atitlan, Guatemala. Located on 18 acres in the traditional homeland of the indigenous Maya. This area is known to the Maya as the belly button of the Earth. 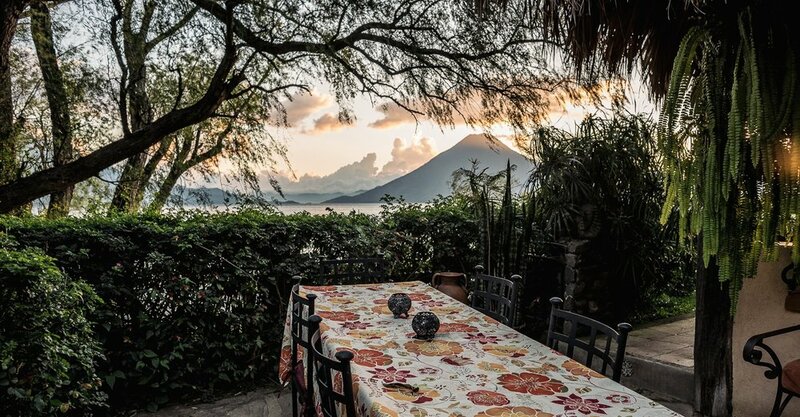 Villa Sumaya looks directly across the lake at three spectacular volcanoes. Villa Sumaya is located at an altitude of 5,000 feet. Its proximity to the equator offers a high plane semi-tropical paradise often referred to as “the land of eternal spring.” The deep caldera walls of the lake create a powerful inverse vortex to the volcanic mountains and ridges above, creating tremendous beauty and distinct natural challenges to work with. In Sanskrit, Sumaya means a long-awaited dream come true while in Arabic it translates as a little piece of paradise. Both of these definitions mirror Villa Sumaya's hearts’ intentions and inspire service. The logo is a Mayan glyph found in Chiapas, Mexico representing the fountain of life or the budding growth of a flower, and this too moves us ever forward. Join Chelsea Winters for seven nights of heart opening exploration of this little piece of paradise. We will breath, move, feel and delve deeper into the nature of our surroundings steeped in Mayan culture, and explore the nature of ourselves. All yoga levels are welcome. $750 non-refundable deposit holds your space with the remainder due Dec 1, 2019. First ten signs ups will receive early bird pricing with $100 off prices below. Early bird pricing is now sold out. 7 nights in lake front accommodations with warm, inviting décor, private bathrooms, outdoor patios, amazing lake views, orthopedic beds and quality linens. Twice daily yoga asana, pranayama and mediation classes with Chelsea, or a guest teacher/guest ceremony, in a sacred and inspiring yoga temple. Simple, eclectic décor with panoramic views, hardwood floors, thatched roofs and elegant altar spaces set the tone for deepening practices. 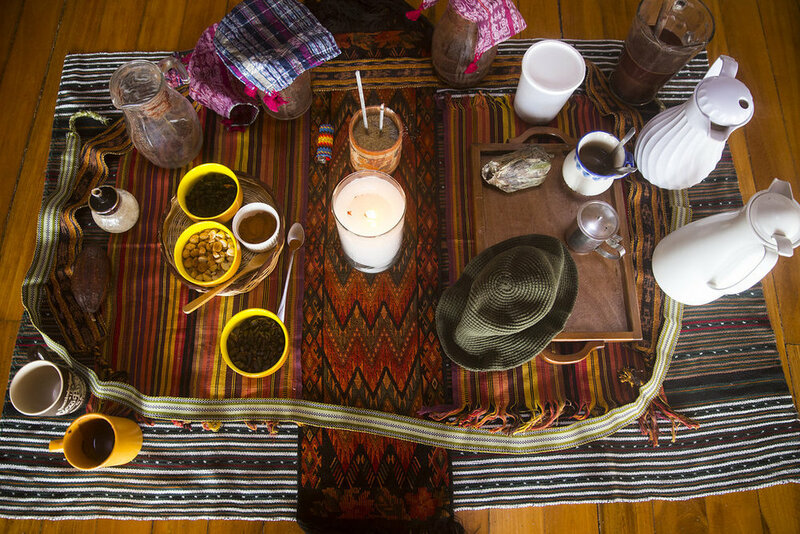 Sacred Cacao Ceremony- In the spirit of the ancient traditions, join us in a sacred circle of ceremony and celebration centered around the sharing of a cacao elixir. Pure cacao is an authentic plant medicine used to uplift the spirit, deepen focused meditation and strengthen our reconnection with heart centered awareness. Known as the “food of the Gods,” cacao has an expansive, mood-enhancing quality that helps us gently shift blockages while realigning us with the path of the heart. Evening of Kirtan- Kirtan is the ancient practice of call-and-response singing. It is an easy, joyful, heart-opening practice from the Bhakti Yoga path. Chanting sacred mantras with live music brings our mind, heart, and body together in a hypnotic and harmonious flow of love. Joining our voice as One we open the door to experience the goal of all Yoga – Merger with the Divine. 3 delicious, healthy, locally sourced meals daily, tastefully prepared and artistically presented- inviting in a true Mayan flair. Meals will take a healthy approach to vegan and vegetarian cuisine. Chicken or seafood will be available for an additional $7/portion. Unlimited filtered water, juice and teas. Cost of transportation to and from Villa Sumaya. Villa Sumaya can assist in the booking of an airport shuttle from Guatemala City to Lake Atitlan, about a 3.5 hour drive. A swift boat ride from the Lake Atitlan ferry dock will bring you from Panajachel to the Villa Sumaya dock. Shuttle and ferry prices vary based on amount of people traveling together... roughly $40/pp one way for a full shuttle and boat. Wifi is available, but not included. $3/day or $20 for the week. I look forward to sharing sun and space with on the sacred shores of Lake Atitlan! Join Chelsea Winters for a mid-winter reset at SunMountain Center, a creative sanctuary for wellness. Located in Manitou Springs, Colorado at the base of Tava (Pikes Peak), stay at historic Onaledge home, situated on six acres of terraced gardens, complete with walking & meditation trails and stunning views of the surrounding mountains. Enjoy farm to table meals, soaking in the near by SunWater Spa mineral waters, yoga, meditation, pranayama practices and deep connection. SunMountain Center creates an unmatched atmosphere encompassing the surreal tranquility of nature while offering an intimate setting to nourish your body, mind, and soul. With an interest in the surrounding culture, SunMountain encourages guests to partake in activities such as touring the land, venturing into the historic city of Manitou Springs (just a ten minute walk away), exploring nearby Garden of the Gods (just a ten minute drive away), escaping to neighboring SunWater Spa for a blissful soak in the Hot Mineral Tubs, as well as many other enticing endeavors. SunMountain Center strives to offer a sacred and meditative space to deepen the connections and expand the consciousness of its guests. During free time, yogis may enhance their experience on retreat by booking a massage and healing session. Join Chelsea for an opportunity to reconnect with yourself- spiritually, physically, and mentally. All rooms are currently SOLD OUT. Please contact Chelsea if you would like to be on a waitlist, in the event that the resort opens up more rooms. $250 non-refundable deposit holds your space with the remainder due on or before Dec 15, 2018. *Room availability is on a first come, first serve basis. Each room has a private bathroom. Space is limited. Nearby nature hikes- challenge yourself and hike the "Manitou Incline"
Join Chelsea for a series of classes where we will explore the powerful nature of our breath, through subtle movements, Kundilini kriyas and poses, various meditations and some mantra. With intention and vibration, tapping into the subtle energetic body, each class will focus on different pranayama practices, balancing the use of effort to sink with ease into a deep savasana and meditation. No experience is necessary and all are welcome. This practice will leave you feeling refreshed and rejuvenated. Each week will have a different focus and feel, sign up for one class, or experience the whole series! Join Chelsea Winters for a 3 part series exploring the elements of earth, water and fire. Each class will include pranayama breath work, a short meditation, and mindful movements to delve into our individual connections to each element. This series will leave you feeling grounded, ready to flow and ignite your ojas, or vital life essence or energy. Series is suitable for all yoga levels. Participants may drop into one class or sign up in advance for all three. Unwind, unplug and reconnect with yourself, nature and Haramara, Mother Sea. In today's busy world it is so important to take a step back and return to our true nature. Join Chelsea in Sayulita on the "Mother Sea" yoga retreat- you will leave with a deeper connection with yourself and nature, feeling refreshed and rejuvenated. Come feed your soul in Sayulita. Described as the place “where Robinson Crusoe meets Architectural Digest,” Haramara Retreat is a magical and idyllic place created and designed to provide a natural and supportive environment for groups, couples and individuals to relax, renew and restore well-being. Haramara is known for, and prides itself on, making each guest’s stay magical. Haramara (“Mother Sea” in the native Huichol Indian language) is an exclusive, intimate and secluded seaside retreat offering superior mind-body-spirit experiences along with sensual tropical harmony to every guest. Haramara offers serenity, seclusion and security to ensure relaxing and renewing yoga and wellness retreats. Click here for a video tour of Haramara! $750 non-refundable deposit holds your space with the remainder due Dec 1, 2017. Sign up by September 1st for early bird pricing! * Room availability is on a first come, first serve basis. Each cabaña has its own private bathroom with sink, toilet and hot water shower. Female only dorm accommodates up to 8 people and has two private bathrooms- each dorm bathroom has 2 sinks, 1 toilet and 2 hot water showers. All accommodations are hand built and offer exceptional views of the ocean and jungle canopy. All cabanas are currently SOLD OUT. Please contact Chelsea if you would like to be on a waitlist, in the event that the resort opens up more cabanas. 7 nights in Pacific Ocean and jungle canopy view accommodations in open air cabañas. All accommodations are spacious & shared occupancy. Scattered across the beautiful tropical hillside, each individual cabaña has been hand-built of all natural materials and offers exceptional views of the ocean and jungle canopy. Each cabaña is situated to offer privacy and seclusion while still taking advantage of the spectacular views. Each cabaña has its own unique and individually designed private bathroom with hot water and an open air shower with a view. Twice daily yoga asana, pranayama and mediation classes with Chelsea in the open air, ocean view yoga shalas. On two separate knolls, each with a different but expansive view, sit two magnificent yoga shalas. Each yoga shala has been hand-built of all natural materials with high roofs and handcrafted hardwood floors. Both yoga shalas are positioned to take advantage of the panoramic and ever changing views of the lush mountains and vast ocean while also taking advantage of the soothing ocean breezes. 3 delicious gourmet, locally sourced meals daily, tastefully prepared and artistically presented by some of the finest chefs in Mexico. Meals will take a healthy approach to vegan and vegetarian cuisine, with optional local seafood offerings. Unlimited filtered water. 1 afternoon daytrip into nearby Sayulita. 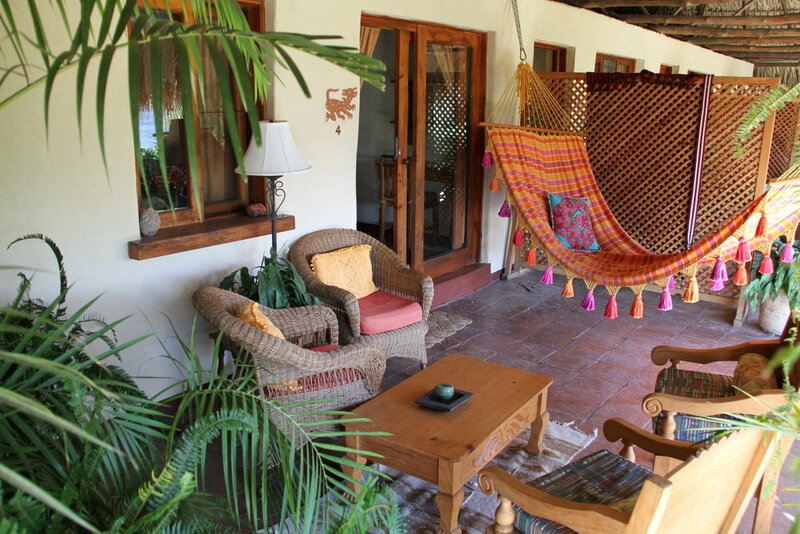 Additional trips into Sayulita optional via a short taxi ride or a 20-30 minute walk. Thursday evening Temazcal Ceremony- Participate in a drug free trip of the senses. The Temazcal, or Sweatlodge Ceremony, is a very ancient purification ceremony that symbolizes the cycle of death and rebirth. The ceremony is a journey, both challenging and beautiful, with many colors and sensations. It cannot be fully described or explained as each person’s experiences along their journey will be different. Click here for more details on amenities, location and the beauty that is Haramara! I look forward to sharing sun and space with you in the magical natural environment outside of Sayulita, Mexico! Join Chelsea Winters for an end of year, intentional flow at Dogma Athletica in Edwards. The room will be dimly light by candlelight to warm your heart and ignite your soul as we celebrate 2017 and embrace the potential of the coming year. Unwind during the busy holiday season and use your own breath and movement to ease you into a greater sense of calm and bliss. All levels welcome. Call Dogma 970.688.4433 to reserve your space, or sign up online! Join Chelsea Winters for a Thanksgiving morning, all levels heart-opening slow flow with a fun playlist featuring favorites from the Grateful Dead. Dogma Athletica will be closed today, but will open just for this class. Class is free to both members and non-members, bring a friend or family member! Join Chelsea Winters and Tracy Miller of Colorful Cooking at the Avalanche Ranch Hot Springs November 10-12th for a Pre-Season Local's Retreat! Avalanche Ranch is best described as a Rocky Mountain Picture Post Card in the Heart of Colorado. This pastoral setting offers the beauty and peace of an earlier era. Situated at 7000 feet, overlooking the Crystal River, with Mt. Sopris towering above at 12,953′, the views are more dramatic than you can imagine. Welcome to Yoga in the Park. Join Chelsea and DJ Kirby for a fun flow outside in the Eagle Town Park this summer on Sunday July 16th from 9:30-10:45 am for all levels, outdoor yoga. The class is donation based and 100% of the donations benefit Ute Springs. Please bring your mat, water bottle and sunscreen. Vail Valley Yoga Directors and Studio Owners unite for a 90 minute yoga class followed by some time to catch up with your yoga friends from throughout the valley. The class is free and is a great opportunity to flow with yogis from both up and down valley, as well as work with teachers that you maybe normally would not practice with. Each teacher will teach a segment of the class round robin style, all to the live beats of DJ Kirby. Please bring a mat and water bottle. Join Chelsea in the Baja for an intimate wellness retreat like no other. Take the chance to discover and develop your yoga practice at one of the finest locations in the Mexican Baja, Prana Del Mar. Prana del Mar is located at the beach on five beautiful acres near the southern tip of the Baja peninsula. With the mountains to the east, the Pacific to the west, and the desert all around, we are comfortably nestled in a tranquil valley that provides an ideal setting for rest, relaxation, rejuvenation, and exploration. With 16 eco-luxury guest rooms and suites, delicious cuisine, two spacious yoga studios, a stunning beach just steps away, and warm Mexican hospitality, you will enjoy a wonderful respite from your daily routine. Lounge by the pool, soak in the hot tub, relax in the sauna, and sample an array of spa treatments from massages to body scrubs to reflexology. You’ll have the option to fill your stay with activities from surfing to horseback riding to whale-watching or to simply sink into the rhythm of Baja — wandering the gardens, resting in a hammock, walking the labyrinth, and practicing yoga. With so many possibilities here, each guest has the freedom to choose his or her own path. Space is limited, inquire for details! *Ask about the repeat yogi discount! Visit www.PranaDelMar.com for more details on amenities and location. "I look forward to sharing sun and space with you in the desert paradise of the Baja!" Contact Chelsea to reserve your spot! Join Chelsea Winters, Nicola Farrer & DJ Kirby at the Avalanche Ranch Hot Springs April 24th-26th for an End of Season Local's Retreat! *ask about the repeat yogi discount, if you joined us last spring! Join me and DJ Kirby Sunday, January 8th 9:30-10:30am in the Lululemon Vail Show Room, for a pre-ski slow flow. Mindful movement with live music from DJ Kirby. Enjoy a post-yoga Sunday morning mimosa! Space is very limited, please email me to reserve your spot! Join Chelsea Winters for an end of year, intentional flow at Dogma Athletica in Edwards. The room will be dimly light by candlelight to warm your heart and ignite your soul as we celebrate 2016 and embrace the potential of the coming year. Unwind during the busy holiday season and use your own breath and movement to ease you into a greater sense of calm and bliss. All levels welcome. Call Dogma 970.688.4433 to reserve your space, or sign up online! Join Chelsea, DJ Kirby, Lululemon & Dogma Ahtletica for a fun all levels flow in the Lululemon Vail store. We will close down the store to the public and transform the store into a studio for an all levels flow to live music from 6:15-7:15pm, following by drinks, apps and holiday shopping. Space is extremely limited, please RSVP if you would like to attend: crfimbel@gmail.com The event is free, please bring a non-perishable food donation for the Salvation Army as your entry! Join me for a Post-Thanksgiving, all levels heart-opening slow flow with a fun playlist featuring favorites from the Grateful Dead. Come for the flow, stay for wine and cheese! A fun evening, free to Aria members and only $15 for non-members. Join Chelsea Winters, in collaboration with Dogma Athletica, for an all levels, donation based, fun vinyasa flow in the Eagle Vail Community Garden. Open to all ages and all abilities! Yoga from 2:30-3:30pm. Suggested donation of $10 per person. A portion of all donations goes back to the Eagle Vail Garden. Participants will receive a voucher for one free yoga class at Dogma Athletica. Participants will also be part of a raffle with a giveaway for a free 5-punch pass at Dogma Athletica. Join Chelsea Winters & DJ Kirby, in collaboration with Dogma Athletica, for an all levels, donation based, fun vinyasa flow in the Eagle Vail Community Garden. Open to all ages and all abilities! Yoga from 4-5pm. Participants will receive a voucher for one free yoga class at Dogma Athletica. Participants will also be part of a raffle with a giveaway for a free 5-punch pass at Dogma Athletica, as well as one pass to Eagle Yoga Fest in October! Suggested donation of $10 per person. A portion of all donations goes back to the Eagle Vail Garden. Join Chelsea Winters & DJ Kirby, in collaboration with Dogma Athletica, for an all levels, donation based, fun vinyasa flow in the Eagle Vail Community Garden. Open to all ages and all abilities! Yoga from 4-5pm followed by a plant-based potluck dinner with byo beverages. The summer solstice occurs when the sun reaches it highest position in the sky. Surya Namaskars, or sun salutations, have roots leading back to India and the worship of Surya, the Solar Deity. Join Chelsea Winters for a fiery mandala flow in honor of the sun's power and light. Guaranteed to make you breathe, sweat and wring out any lingering remains of a long, cold winter. Workshop will include 90 minutes of asana, meditation and pranayama- all levels are welcome. Space is limited, please reserve your spot with the Dogma Athletica front desk: 970.688.4433. This all levels, intentional movement workshop will incorporate breath work and slower asana, as well as meditation and energy work. Chelsea is a certified Reiki practitioner, a technique for stress reduction and relaxation that also promotes healing. This hands on workshop will help increase the flow of prana or life force through our bodies so we are more capable of being happy and healthy. Reiki can help to create balance in the physical body as well as work on an emotional and vibration level to help strengthen the immune system and heal. This two hour workshop will create more space in the body, will clean out old energy inviting in fresh vibrancy and guarantees to leave you feeling restored and rejuvenated. Join Chelsea Winters and Nicola Farrer at the Avalanche Ranch Hot Springs April 24th-26th for an End of Season Local's Retreat! Join Chelsea in Nicaragua for an intimate wellness retreat like no other. Take the chance to discover and develop your yoga practice at two of the finest locations and untouched gems that Nicaragua has to offer. Laguna de Apoyo is a mineral rich thermally vented crystal clear basin of water encircled by a protected ecological nature reserve on the mainland and Little Corn Island is a pristine tropical island surrounded by turquoise waters and white sandy beaches located on the Caribbean side of the country. With a focus on earth, water, fire, air and space, join Chelsea for seven nights in paradise to delve into asana, pranayama and meditation and to explore and cultivate your relationship with the natural elements. Visit Apoyo Lodge's and Yemaya Little Corn's websites for more details!